Marula By John Paul Selects is named after "co-founder, humanitarians and entrepreneur John Paul DeJoria" who you might remember as the co-founder of Paul Mitchell haircare. Marula by John Paul Selects asserts, "all our brands support sustainability, social causes and the way they make this world a better place." Marula By John Paul Selects Pure Marula Facial Oil contains 99% Marula Oil and 1% Essential Oil Fragrance Blend (Linalool, Limonene). It is an antioxidant rich anti-aging face oil that hydrates and protects the skin while leaving it soft smooth and supple. Marula Oil provides the skin with serious hydration, soothes irritated skin, lightly plumps fine lines, and offers skin a healthy dose of radiance. Pure Marula Facial Oil has a light and fresh quasi-herbal scent that dissipates quickly upon application. The texture is light and emollient, but I found that it took a little massaging before it would fully sink into the skin. However, applying it to warm and slightly damp skin does make it sink in more quickly. It also works brilliantly well on cuticles and hair, and during my testing period I applied to my cuticles daily, and saw an amazing difference. Specially formulated for the face and neck, premium Marula Oil is a naturally soothing treatment that provides intense hydration, protection, and rejuvenation to reduce the appearance of fine lines and wrinkles for soft, radiant skin. It is suitable for all skin types and contains a high content of fatty acids, resulting in fast absorption to leave skin smooth with a matte finish. Clinically proven to contain a great deal of antioxidants and omega acids, it can be used alone as a highly effective anti-aging moisturizer, added to other facial products to boost their efficacy, soothe skin after facial treatments or sunburn, or used as a perfect makeup primer. The deliciously fresh scent that stems from a one percent essential oil blend and provides a total sensory experience upon application, then dissipates so it won’t fight your fragrance. Light and hydrating, Pure Marula Facial Oil absorbs quickly into the skin without a greasy after feel providing immediate and long lasting hydration and improved skin elasticity. Pure Marula Oil by Marula Pure Beauty Oil is the only doctor endorsed, scientifically validated facial oil, with 60% more antioxidants than the leading Argan Oil. 100% Pure Marula Oil is completely virgin, wild harvested, hand-selected, and cold pressed with no added heat or chemicals ensuring that its beneficial properties are captured in every bottle. This superior facial oil leaves skin soft and plump with increased firmness for healthy, beautiful, age-defying radiance. Primer -mix with your foundation for added moisture. 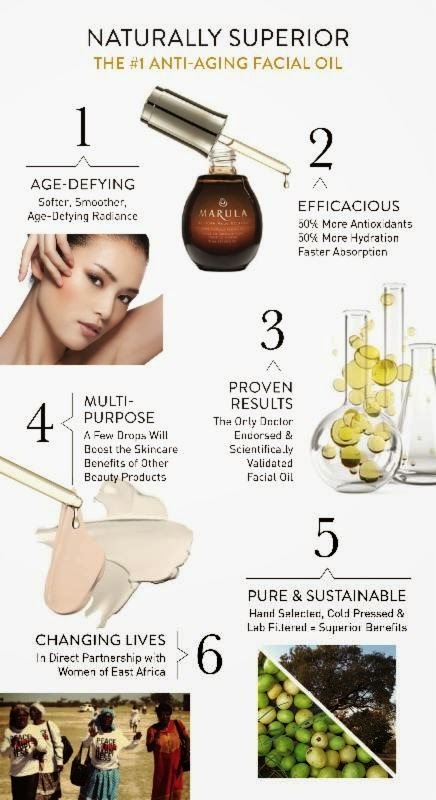 Marula By John Paul Selects suggests adding Pure Marula Facial Oil to other skincare and Beauty products in order to boost their efficacy, and I can attest to the wonders of this practice since I have been doing this with my facial oils for many years. Furthermore, when added to foundations and tinted moisturizers, skin is left delectably luminous. Ingredients: 99% Marula Oil, 1% Essential Oil Fragrance Blend (Linalool, Limonene). Free of Parabens, Sulfates and Phthalates. In Fair Trade partnership, Marula is derived from wild-harvested, hand-selected Marula nuts by East African women, then cold pressed for the highest quality and purity. Marula is also completed sustainable—only the fallen fruit is collected. By using the fruit for jams, the nuts for Marula Oil, the shells for charcoal, and providing value to the wild stands of trees, the trees are protected. Proud member of the Fair Trade Association and Green America, it is doctor-endorsed, scientifically validated, and clinically proven. Overall Assessment: Marula By John Paul Selects Pure Marula Facial Oil is a very nice multipurpose face oil from a company with a deep and abiding interest in sustainability and social causes. Well done. $15.00 for 0.23 oz., $58.00 for 1 oz. and $78.00 for 1.69 oz. from Sephora, Amazon (Affiliate Links). It definitely works well on my combination skin, but I don't find that I get a matte finish. Once it absorbs my skin has a lovely glow, but it is not left in the least bit oily! It's quite nice! Beautiful packaging, and I love that they follow Fair Trade practices. It is a very nice oil. I'm trying to do the same– because I tend to spend a lot in February since it is not only the time of the Barneys and Space NK bag events, but because it is also my birthday month which means that I tend to treat myself more than usual! What have you purchased so far this month? Did you finally get the AB Balm to work for you, or did you ultimately end up sending it back to Space NK? Ooooh! I love oils, I'm gonna have to add this to the list! I do it, in fact I am completely obsessed with oils! This one is worth checking out! Great review! Now I am convinced of trying it out. It sounds like a good one indeed. Love the idea that it gives a beautiful glow. Thanks, Sue! It's a very nice oil! Wow, then it might be worth trying out if you are in the market to buy a face oil! Agreed, Bailey! Oils definitely work well pre-foundation. I tend to apply them directly to freshly cleansed skin (or on top of a thinner serum) and then add a drop again before, or in my foundation. THey are so much better for the skin than silicone-laden primers! This sounds nice! So do you apply a few drops and then moisturizer, or do you actually mix it up with your other products? Hi Deborah! I first apply my oil to freshly cleansed and slightly damp skin (or over a lighter serum) and then my moisturizer on top. I also often add a drop to moisturizers, foundations and tinted moisturizers. That said, for me face oils are an essential part of my beauty routine, and I use them with just about everything!